About CCENT certification:CCENT -Cisco Certified Entry Networking Technician is an entry level Cisco certification. 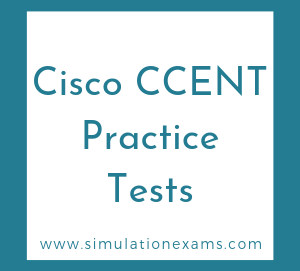 Getting CCENT certified ensures that the candidate has enough knowledge to plan, configure, and operate simple WAN and switched LAN networks using Cisco products. No pre-qualification is necessary to take CCENT exam. 100-105 is the only exam necessary to pass for obtaining CCENT certification. 100-105 is required for achieving CCNA, which covers medium size enterprise branch networks with more complex connections.